Seekh Kebabs is a recipe inspired from middle eastern tradition and terrific appetizers made from chicken or goat meat,they can also be served as side dish with the main meal. grilled it in oven and by frying and trust me both came out with good taste. please read the complete recipe for the directions. 2.Put all the mince chicken in a large bowl and add chopped onions, garlic, ginger, coriander. and grind it together,add beaten eggs and bread crumps to it and mix thoroughly with either your hand or a wooden spoon. 4. Take a large hand-full of mixture and flatten it on the barbeque skewer,if skewer is not available then wooden spoon can be used instead. 5. Preheat the oven at about 420 degree farenhiet.Once the oven is preheated,put foil on to your grill and put your kebabs over the hot grill. Alternative cooking if you don’t have oven at home. 6. Cook the kebab’s directly over flame for a minute. 7. Heat a little oil seperately in a frying pan. 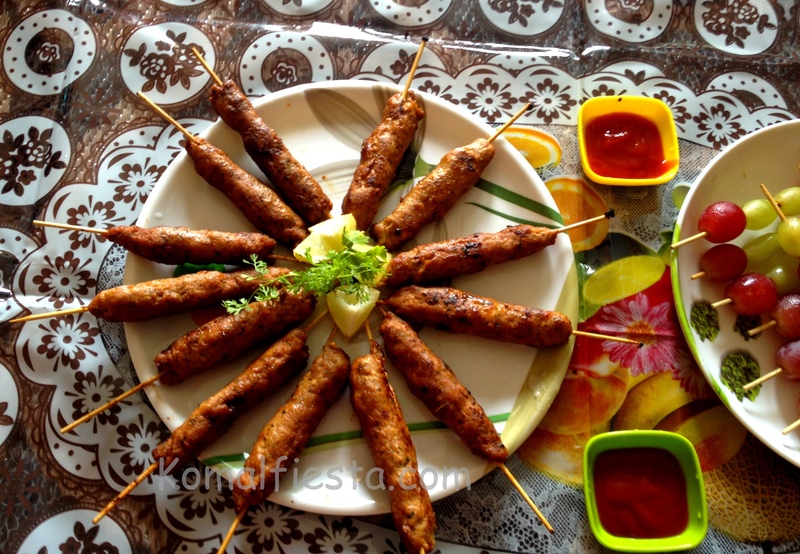 As soon as the kabab gets roasted remove it from the skewer and put into frying pan. Fry well on all sides by rolling with wooden spoon. After frying, remove from heat and place kababs on absorbent paper or paper towel to drain out excess oil. Serve on a bed of lettuce. garnish with tomatoes, onion rings or spicy green chutney. Brush the foil papaer with oil before setting the kebab’s over it to avoid sticky of kebab’s. While cooking the kebabs on the grill , turn the sides at 10 minutes interval so the kebab’s gets grilled evenly. This entry was posted in Indian quick and easy recipes, Non vegetarian recipes, Ramadan Iftar Recipes, Snacks and tagged chicken appetizers, chicken kebabs, chicken snacks, indian easy snacks, indian non veg recipes, indian non vegetarian recipes, indian quick snacks, kids quick recipes, non veg snacks, seekh kebabs.